She was generously talented as she could sing any song just hearing it once, one or two studio takes was all she needed. Sadly she was shot to death (by an individual targeting her brother) just two weeks before her first record finally came out. 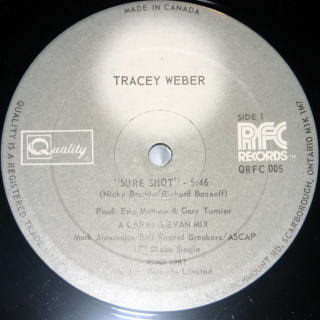 Sadly both Tracy and Larry Levan who mixed the tune are no longer around which is a shame as the music itself lives on over 25 years later. It would of been nice for them both to of seen how their music has survived the test of time whilst reaching even wider audiences over a quarter of a century since this particular tracks release on RFC Records in 1981. Hear what ya saying, just love the instrumental bit 2/3's in, what a bumper tune!! !